Great salsa comes from fresh vegetables out of the garden. Wouldn’t you love to be able to have and to share the salsa you made after the growing season? This article will teach you how to make salsa, plus canning methods for preserving the salsa for up to a year. 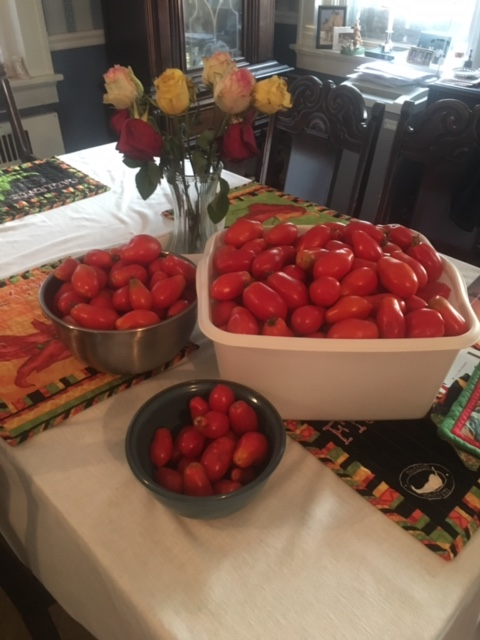 We received an unexpected gift early this week from a friend…thirty-five pounds of Roma tomatoes. 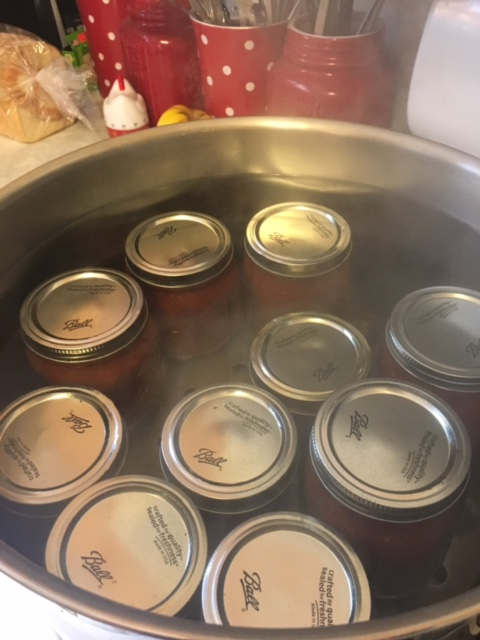 Not wanting them to go bad, I quickly went to work, canning seven quarts, and dehydrating several trays. Still, there were several pounds left. 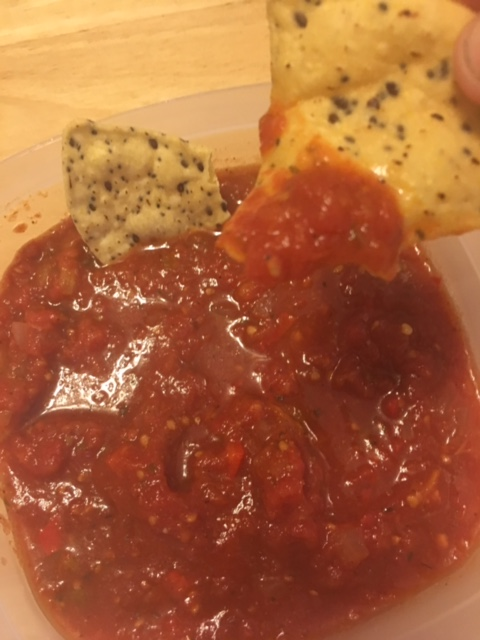 I decided to make and can a batch of salsa. 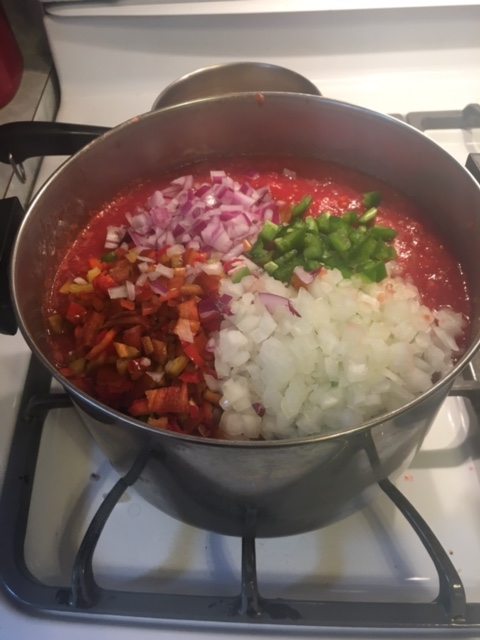 Now, that much salsa is a bit labor intensive…the tomatoes need to be peeled and chopped along with the peppers and onions. 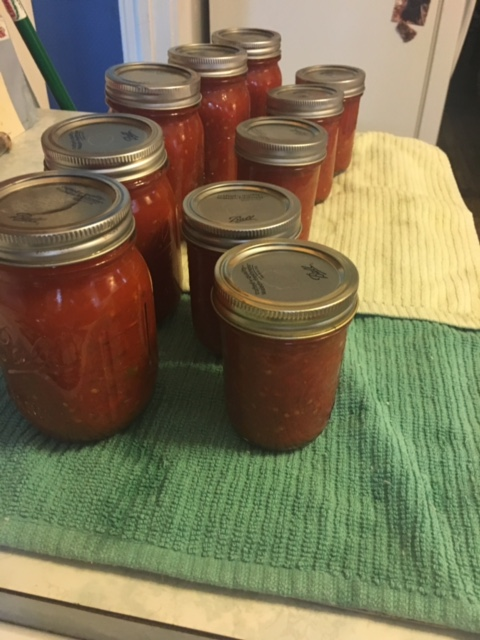 And, canning salsa is a bit more involved than just making a small batch. The recipe starts with five pounds of Roma tomatoes, or enough to yield fourteen cups of chopped tomatoes. Since it takes a while to peel and chop the tomatoes, I decided to make this a two-day process. The first day, I weighed the tomatoes, washed them, then dropped several at a time in boiling water for one minute to loosen the skins. Immediately, I removed the tomatoes and placed in a large pan of ice water. The skins peeled off easily. I removed the cores and any spoiled parts of the tomatoes, and chopped the prepared tomatoes in small batches using a blender on the lowest setting. 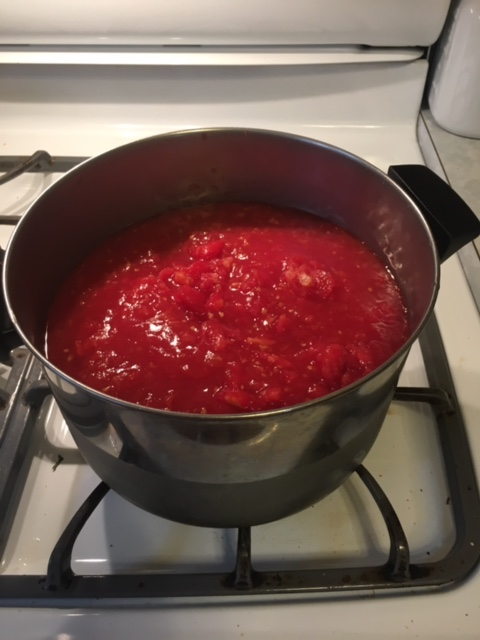 When I had fourteen cups of chopped tomatoes, I placed them in a large pot and refrigerated them until the next day. 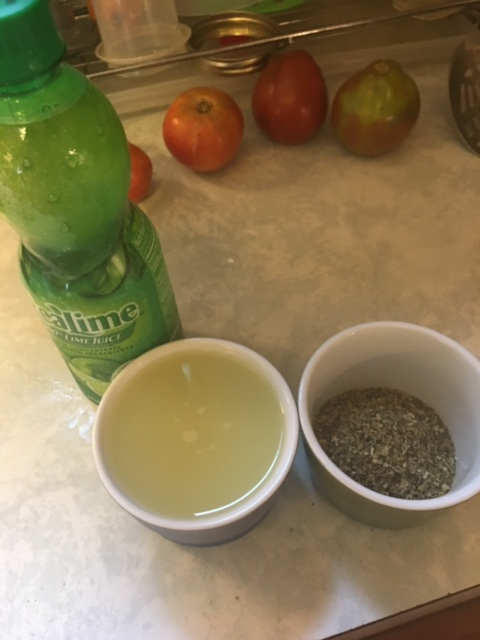 Next, I measured out spices…1/2 teaspoon garlic powder, 1 tablespoon salt, 1/2 tablespoon black pepper, 1 tablespoon ground cumin, and 1 and 1/2 tablespoons of dried oregano. These were the spices listed in the recipe, but you can add any spice or seasoning you like, and/or adjust the amount to your taste. I also added a couple pinches of crushed, red pepper. Combine tomatoes, onion, and all the peppers in a large pot. Bring to a boil, reduce heat, and simmer for 10 minutes, stirring often. Add seasonings, herbs, and lime juice and simmer an additional 20 minutes. 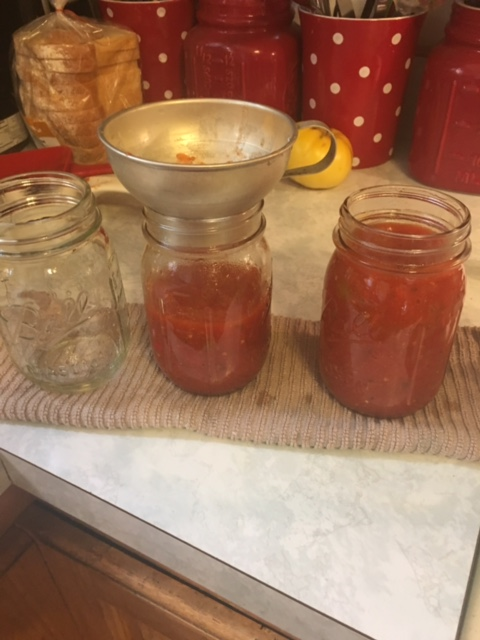 Ladle the salsa into clean, hot jars. Wipe rims, place lids, and process in a hot water bath canner. (The amount of time to process depends on the altitude of where you live…see link below.) In my neck of the woods, the pint jars are processed for 15 minutes. The recipe yields about 8 pints of salsa. I processed 5-pint jars, and 5 half pint jars, and had almost a pint left over to refrigerate. Salsa is a wonderful way to enjoy the fresh taste of ingredients from your garden. Canning the salsa allows the fresh taste to be enjoyed and shared in the months ahead. Give it a try, it is not that hard and the rewards are great. Watch the video below and check out the tips to get you started. 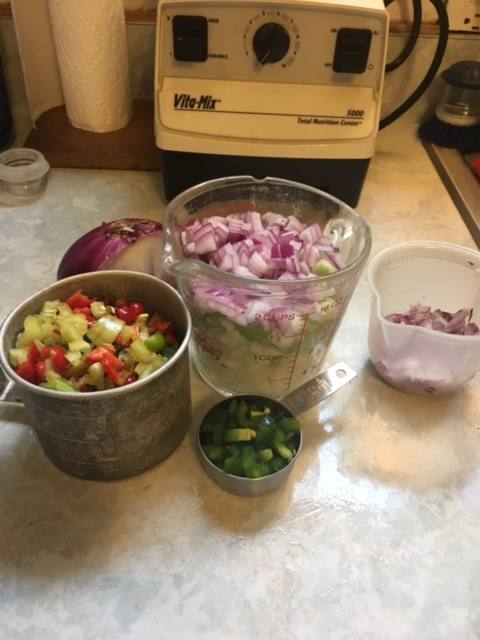 Remember to measure your tomatoes, peppers and onions exactly to keep the ratio of acidity consistent. 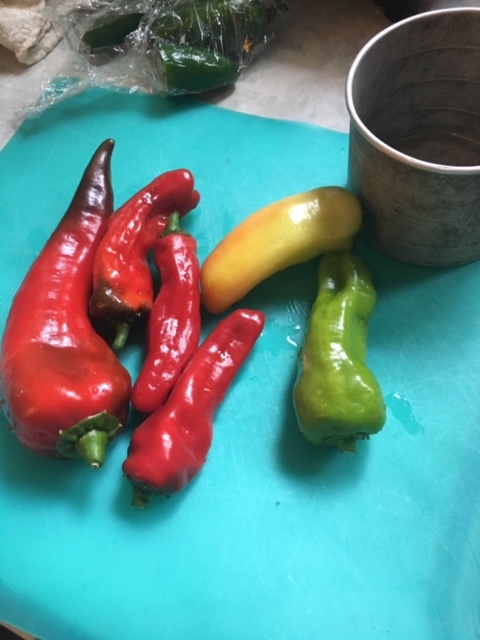 Wear plastic or rubber gloves while seeding and chopping the jalapeños or any other hot pepper you use. Removing the seeds and inner membranes of the hot pepper will reduce its heat. Place tomatoes in small batches in boiling water for one minute, then place in a container of ice water for easier peeling. Any combination of spices you desire can be added, other than the ones listed in this recipe.